How soon is too soon to promote healthy newborn sleep habits? The short answer is, yes. But the better answer is… Your newborn is too little to formally sleep train, but is of the perfect age to start setting in place some healthy newborn sleep habits. I would love to share with you a few newborn success stories so you can see the benefit of investing in a prenatal or newborn sleep education package to get your family started on the right path for successful sleep in the days, weeks, months and years to come! Rebecca was gifted a newborn sleep guide as a baby shower gift. She has an 2.5 year old son who didn’t start sleeping through the night until he was 2, and she refused to do that again. So, she was really invested in learning the ins and outs of newborn sleep and instilling healthy newborn sleep habits with her second kiddo from the get go. She knew that with a toddler at home and newborn baby on the way, it would be important to really focus on sleep for their entire family. If you are a parent who is having to bounce your little one to sleep at night, you know what a physical stressor that can be for your body! When Helen reached out to me, I knew we needed to break her daughter of the bounce to sleep association or her poor mama was going to end up with terrible back and joint pain! One of the biggest mistakes that newborn parents make is keeping their little one up too long during the day. This 100% of the time results in overstimulation and overtiredness. I am sure to prioritize with my clients the ideal timing, at various ages in the newborn stage, for feeding and sleeping so that the whole family is fed, happy and well-rested multiple times in a day! 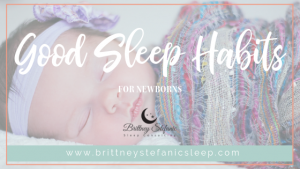 The final aspect of the newborn sleep education and healthy newborn sleep habits that I want to showcase is the often overlooked bedtime routine. This piece of a little one’s schedule is so important but often rushed, inconsistent or completely neglected by busy parents. When I started working with Jessica and Shawn, their son was 6 weeks old and they did not feel they had time for a bedtime routine with him. Why do I teach newborns the skill of sleep? 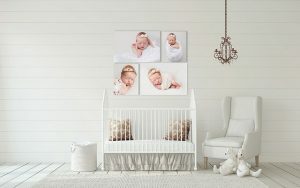 Working with families before baby comes or during the 4th trimester (first 12 weeks of life) to reach the sleep milestones that are described by my clients above is such a pleasure for me, and I LOVE when parents are being proactive in their approach to sleep by creating healthy newborn sleep habits from the start. I am also partial to this age group because this is the age my son was when I found the Sleep Sense program and utilized it for his sleep habits. 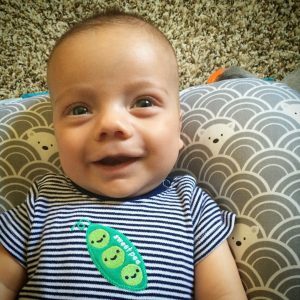 He was 8 weeks old when I was familiarized with newborn sleep education, and by 12 weeks, he was sleeping through the night! I have personally seen (and felt) the success of starting early and what an impact it can make on the lives of parents! You can read more about our experience using Sleep Sense here! I find such value in setting the stage for good sleep in these early weeks, rather than trying to fix old habits and “start over”. Maybe it’s the teacher in me who loves the fresh start of a new school year, but there’s something about a blank slate and brand new life of a snuggly little baby that just brings me so much hope and happiness! And when they have healthy sleep habits… WOW, my baby fever starts all over again!